This is another one of those designs that first appeared in my mind half-formed and hazy, and then solidified as soon as I bought the yarn. And while I know I'm reusing some concepts here (I used the same stitch pattern and combination of a solid yarn and a variegated yarn in the Zigazig Ah Scarf), I think that the finished result is pretty and novel, from the faux icords running up the seam to the notched back design. Oh, and some notes on sizing and design here - first off, I know that there's a fairly significant size difference between the small size (which fits up to about a 23" head) and the large size (which fits bigger ones - up to 26.5" at least). 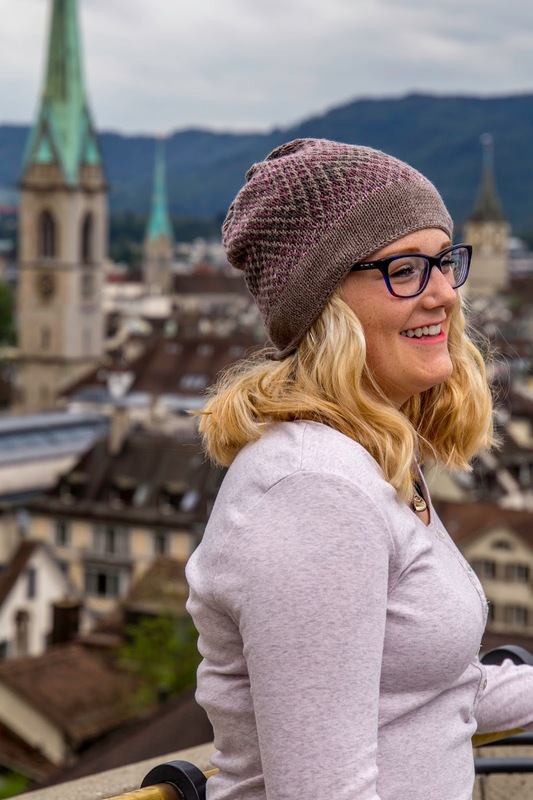 This is for two reasons - one, the design suits either a close-fitting or a loose-fitting wear, so it's not too finicky, and if you're borderline on sizes you can choose based on whether or not you want your hat to fit tightly or slouch (you can also choose a size based on your volume of hair!). 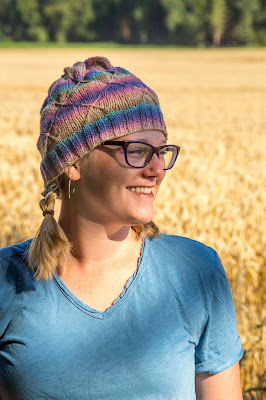 And two, the stitch pattern is 24 stitches long, and, though one could create a medium size by only working 12 of the final 24-stitch repeat, it would no longer be symmetrical in the back, which compromises some of the hat's appeal. All of that being said, if you'd like a truly medium sized hat, you could always work the design on needles that give you a slightly different gauge - for instance, work the large size with needles that give you 26 inches per 4" instead of the given 24. Speaking of symmetry and sizing, I would also like to mention that I successfully worked my entire hat on size 4 needles. However, the icord cast on is a little tight, and required blocking to relax it. If you'd prefer, you could work your icord cast on in a needle one size larger than the needle with which you work the rest of your hat. 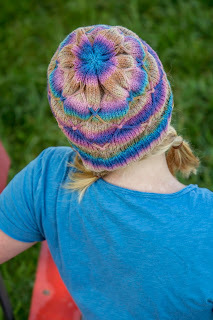 Then you will avoid any too-tight brim issues entirely! Knit this icord row until you're holding 127 (151) stitches on your scrap yarn. Kfb in your first stitch one final time, transfer the first stitch (of your kfb) to your scrap yarn, and then bind off your four icord stitches (which include the second stitch from your kfb). Then, transfer the 128 (152) held stitches from your scrap yarn and onto your circular needle (you can use a 24" if you're making the large size). Once you have all your stitches transferred, continue to use your color A yarn and work as follows. Note that you can pull the yarn tight behind your slipped stitches; this creates the icord look.